The G2 addresses some of the criticisms of the G1, especially with regard to its focusing system. 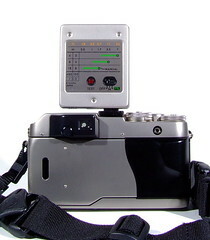 The G1 uses only a passive autofocus "phase detection" system. In this system two CCD arrays achieve focus by minimizing differences in patterns from the physically separated dual array sets. It is extremely accurate under the right conditions, but slow and inaccurate in low light as well as close up photography. The G2 adds an active focusing component that uses infrared beams and triangulation. It combines both technologies to achieve a faster more accurate focusing system. In addition, the G2 has a wider rangefinder base and a higher top-speed of 1/4000 sec in manual mode, 1/6000 sec in aperture priority mode. The lenses made by Kyocera under license from Zeiss for the G-series quickly established it as a contender: the original 45mm f/2 Planar was joined by a 28mm f/2.8 Biogon and a 90mm f/2.8 Sonnar; a 21 f/2.8 Biogon, 16mm f/8 Hologon (manufactured in Germany by Carl Zeiss and a 35mm f/2 Planar, as well as a 35-70mm f/3.5-5.6 Vario Sonnar were added later. The 45mm Planar in particular gained renown as the sharpest 35mm camera lens ever tested by the Swedish test site Photodo — outclassing even the illustrious Leica 50mm Summicron. Zoerkendoerfer in Munich Germany also modified the Voigtländer 12mm f/5.6 Ultra-Wide Heliar and the 15mm f/4.5 Super-Wide Heliar for use with the Contax G mount. 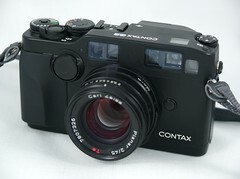 The original Contax G1 is not compatible with the 21mm, 35mm and 35-70mm lenses. 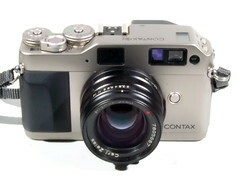 Contax provided a firmware upgrade for many of these cameras. Such upgraded G1s may be identified by a green-colored sticker in the film chamber. It is not possible to use the 35-70 zoom lens on the Contax G1 even with the upgrade, as the G1 mount lacks the electronic interface for it. 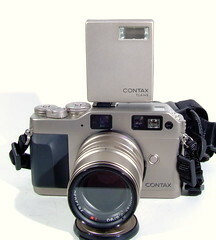 Both camera models feature TTL/OTF capability and are compatible with the Contax TLA flash system. The Contax TLA140 and TLA 200 flashes were specifically designed for the Contax G series, but other flashes, especially the Contax TLA 280 and TLA 360 also work well with these models. Multi-flash cords are available and up to six Contax TLA-compatible flashes can be controlled from a single camera simultaneously. 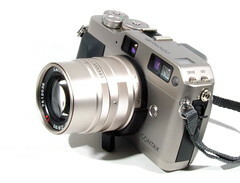 In 2005, Kyocera announced it would cease all activity related to the manufacture of Contax cameras at the end of the year, effectively spelling the end of the G system. Carl Zeiss also worked in conjunction with Cosina, the producer of a line of Leica M mount and screw mount clones to provide Leica M mount Zeiss lenses, as well as a manual focus rangefinder camera, the Zeiss Ikon, developed by Zeiss and manufactured in Japan by Cosina. With its titanium clad body, sophisticated electronic rangefinder and superb lenses, the G system has not been equalled in the years since its introduction. To its fans, the Contax G2 is the finest 35mm camera ever produced. 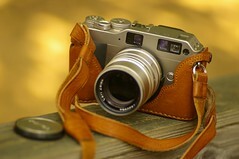 The Contax G system is still available in quantities in the used camera market at prices much below the Leica M system. Users who do not need lenses faster than f/2.0 will find that the Contax G system is still unmatched in camera performance with lens quality equaling the Leica M performance in most cases. Contaxinfo.com: Contax User Forum, MTF Lens-Data, scanned broschures, user manuals, user images etc.